Wow! Seriously two whole years of ladies drinking, learning about and enjoying beer has already passed us by. And because of the momentous occasion you know we celebrated big! 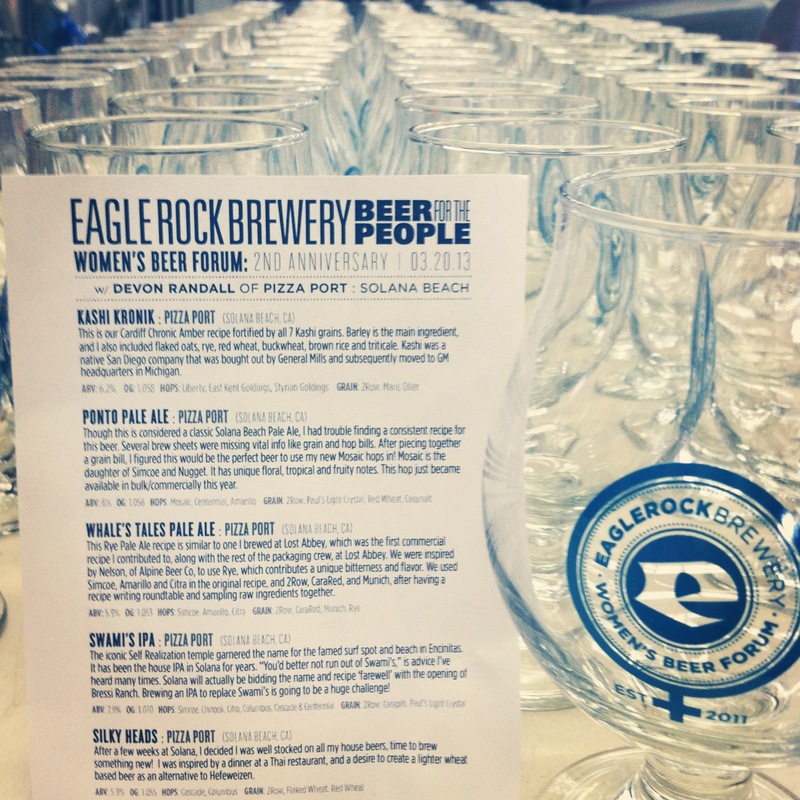 For this event we had Devon Randall; the head brewer of Pizza Port Solana Beach come out with five of her own brews for the ladies to taste and chat about. Devon is one fantastic chick rocking pink hair and making crazy delicious beers and any girl who can work her way to the top of the brewing food chain as fast as she did is excellent in our book. 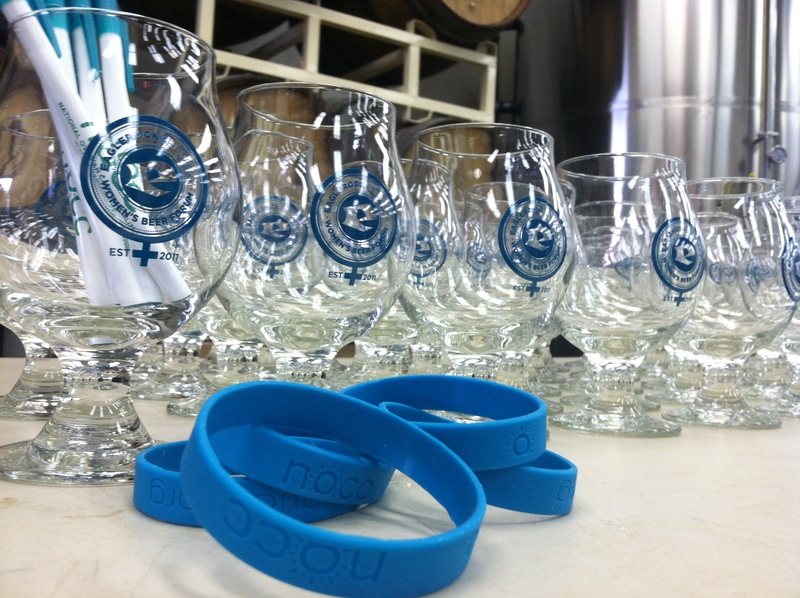 Also special for our two year anniversary were our new Women’s Forum Snifter Glasses! 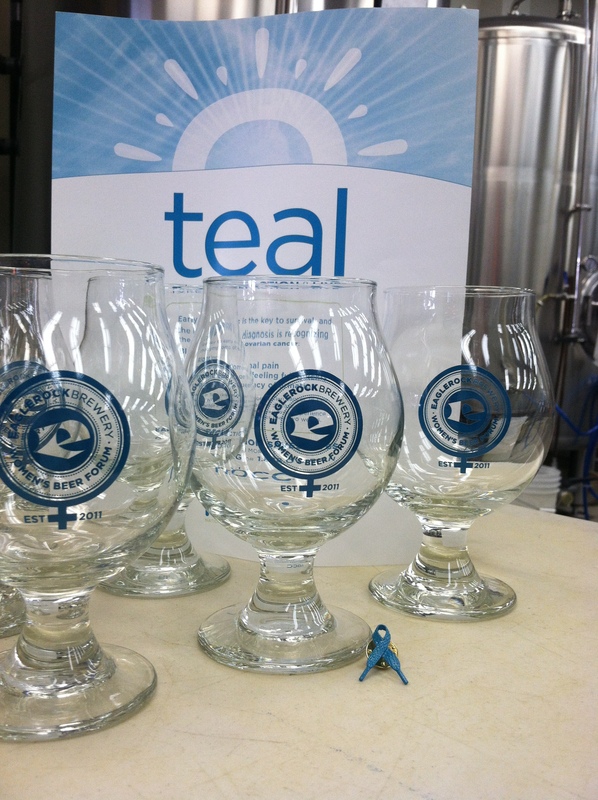 Each glass has a cool teal ERB logo in the shape of the female symbol and a portion of the proceeds from these glasses is going to help support the National Ovarian Cancer Coalition. The NOCC exists to raise awareness and promote education about ovarian cancer. According to their mission statement on their website, the coalition is “committed to improving the survival rate and quality of life for women with ovarian cancer”. It’s a great organization and we’re happy to be able to contribute to their cause. For our fabulous flight of five we tried Kashi Kronik (an Amber using all 7 Kashi grains), Ponto Pale Ale (a pale using Mosaic hops), Whale’s Tales Pale Ale (another pale but brewed with Rye), Swami’s IPA (Pizza Port’s iconic IPA that will soon be produced in their upcoming production facility) and finally Silky Heads (a wheat beer brewed with lemongrass). 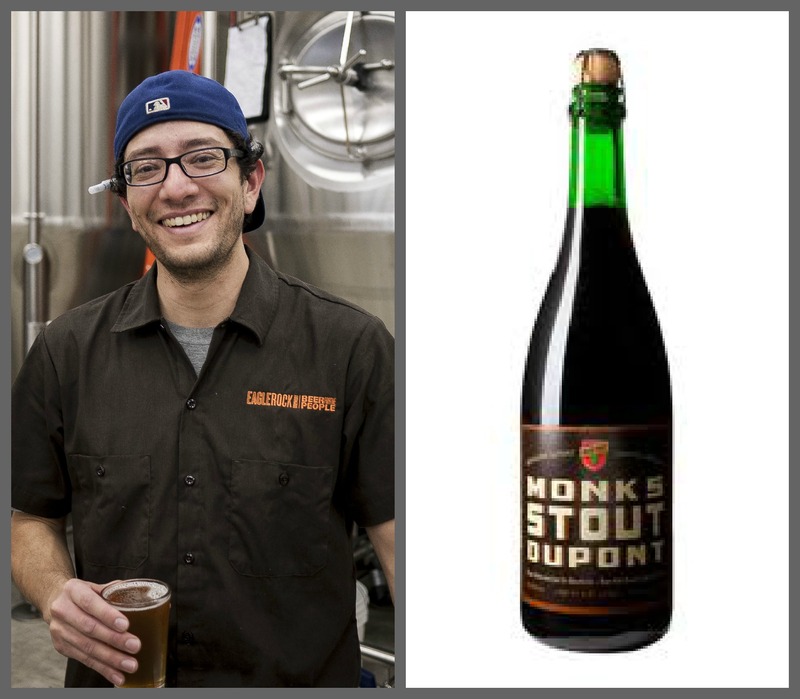 All beers can be found only at the Solana Beach location and are brewed by Devon. 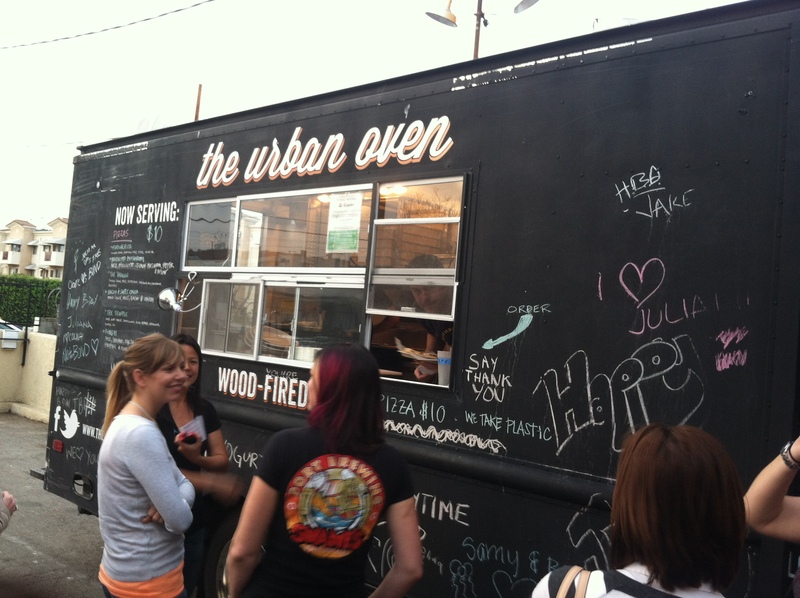 Also joining us for the evening was the Urban Oven Pizza Truck, serving up individual-sized freshly baked pizzas to soak up our tasty flights. It was such a fantastic night and and even better past two years! We want to say thanks to all the ladies who have joined us throughout the past two years of forums and to Devon and many other awesome guest hosts who have helped make these forums extra special. We hope you’ve enjoyed what you’ve tasted and learned and maybe even made some new friends. We’re excited for the forums to come and we hope that you’ll join us! If you’d like to see what’s coming next, and make sure you get your RSVP in for the night, check out our info for the next forum here. But just remember…. 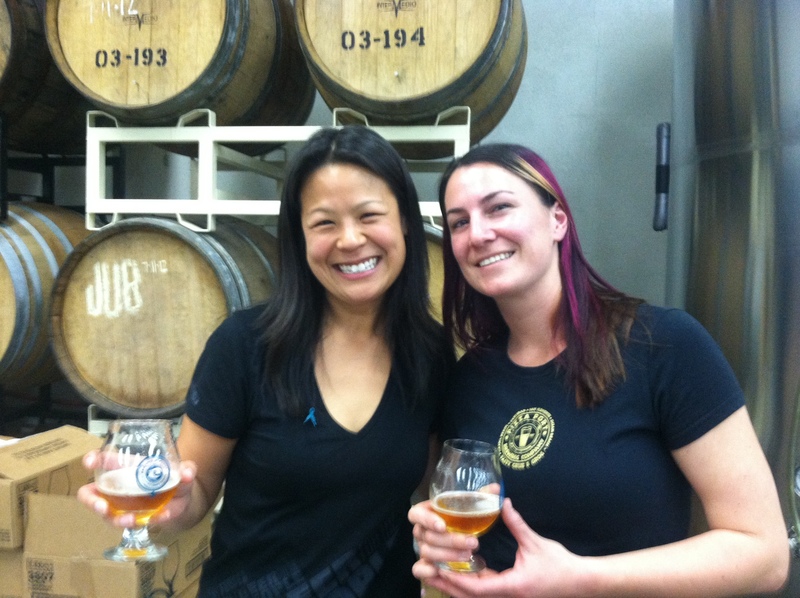 every third Wednesday the ladies will be hanging in the brew house; talking beer. 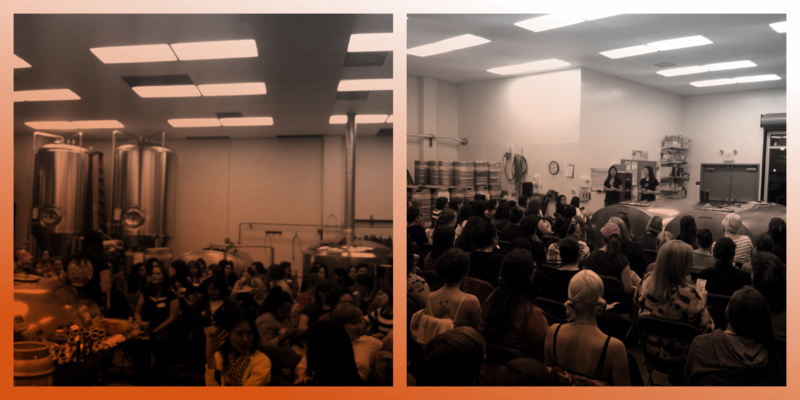 All of the ladies who attended the two year anniversary were able to take own that swanky snifter you saw above and over $150 from this night alone is being donated to the NOCC. 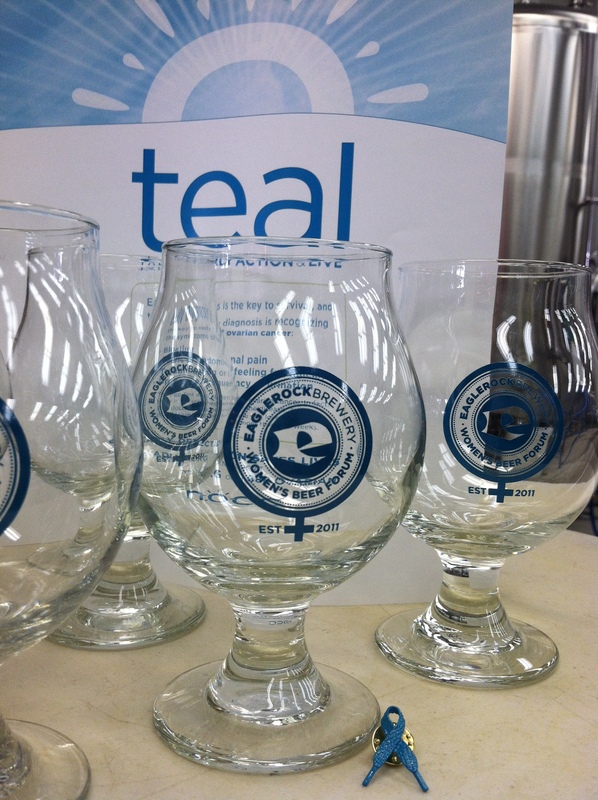 If you’d like to purchase your own glass (and help contribute to the cause!) you still can! 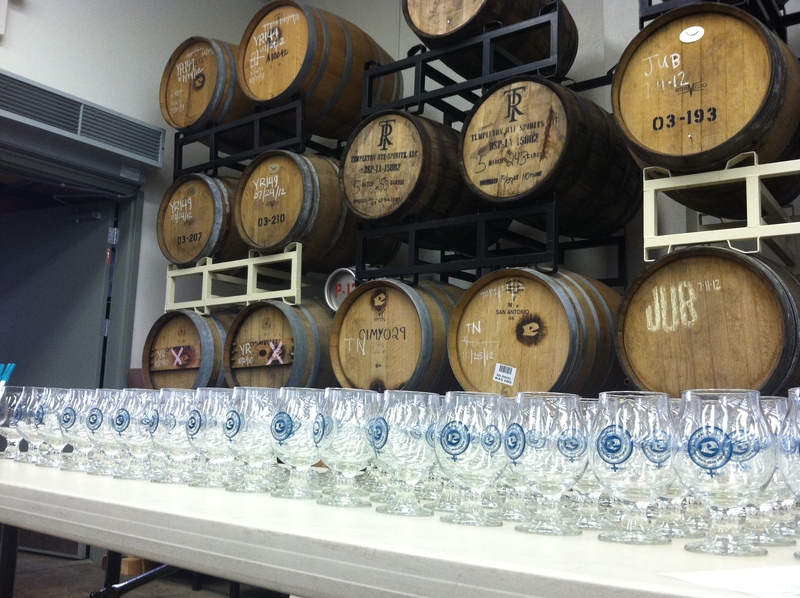 We’ll be selling these great glasses throughout the year in our taproom and online! And we can ship them for you too. So if you’ve got someone you think would love to have this be sure to get one today for just $7. So to continue the series we are going to tell you about the man that fixes it all, drives large Marge, gives the very best brewery tours in town and always whistles while he works…. 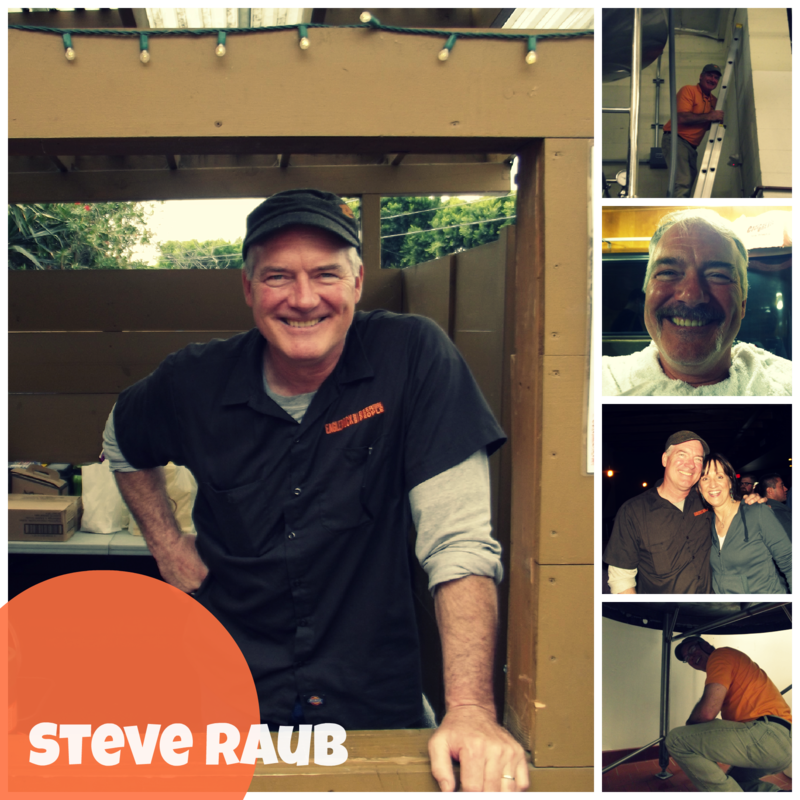 co-owner, Steve Raub. When asked the following questions, here were Steve’s humorous replies. Rohrbach Brewing Co., Rochester, NY – Founder John Urlaub took the time to talk with me, brewed great beer, and inspired me by his example AleSmith Brewing Co., San Diego, CA – E.R.B got started with their former brewing system, they continue to grow and craft awesome beers BridgePort Brewing Co., Portland, OR – Our head brewer Erick Garcia interned there after completing his Brewers’ Guild education, thank you BridgePort! 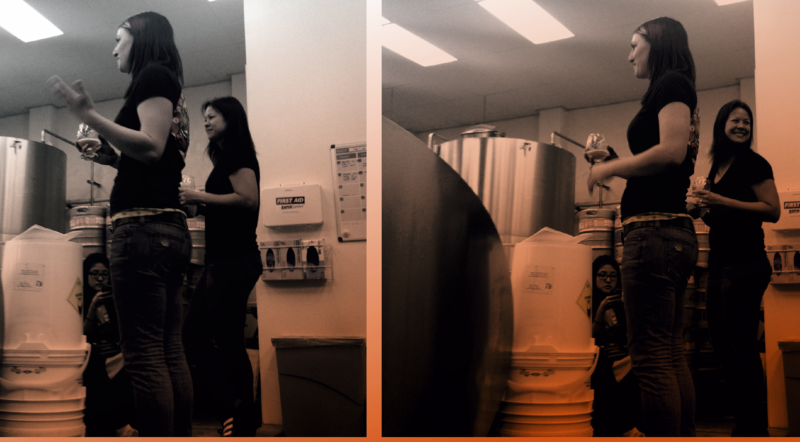 Posted in Brewery Fun, Meet the Team. So to continue the series we are going to tell you about the man that created most of the core brews you love, keeps the biz running and always has a smile on his face…. co-owner, Jeremy Raub. When asked the following questions, here were Jeremy’s clever replies. I try to funnel the daily chaos into a concentrated laser beam, then I attach that laser beam to the head of a shark. I then try to shoot that laser beam at a moving target carried by an agitated monkey, all while riding on the back of the laser-beam-shark. It’s quite exhilarating and fun. Adventuring and exploring new places. Our very first brew day! It was such a long and tedious process to get all the licenses and permits and to build the brewery, so when we finally earned our brewing privileges, it was a huge cathartic moment. A well-made pilsner and a crispy, thin-crust margherita pizza. And some sunscreen. And a helicopter. The ability to insert more hours into the day. I wouldn’t, because as a wise man once said: The world don’t move to the beat of just one drum…What might be right for you might not be right for some. Bali is one of the best and most beautiful places I’ve travelled, and that’s where I saw a mola-mola, which is one of the strangest creatures I’ve ever seen. Anchor Brewing, Sierra Nevada Brewing, Stone Brewing. Because they have all managed to grow and innovate in a way that didn’t compromise the quality of their beer or the integrity of their companies. It’s been a long time since I sat down to write a blog post, but this recent hullabaloo over California growler laws is certainly a good reason to make some time for it! Up until just recently everything seemed to be pretty cut-and dry here in California: Only brewers are allowed to fill growlers (with their beers only) and only into growlers that bear their approved labeling. No exceptions. Customers were frustrated at this but seemed to accept it with only a bit of grumbling. Growlers were getting filled; brewers were selling beer; good beer was being consumed; people were happy (mostly). Then, on February 12, 2013, things seemed to change. That was the day that the California Craft Brewers Association (CCBA) held a workshop for its members at the University of California San Diego. The title of this workshop was “Know Your ABC’s”, and the purpose was to educate California brewers on the regulations of the California Dept. of Alcoholic Beverage Control (ABC), and to help those member brewers stay in compliance with those laws. During the first part of this workshop Jacob Appelsmith, the Director of the ABC, made a statement to help clarify California growler laws. California law does not define the term “growler”. Since a “growler” is a container used to contain beer, a growler is therefore considered a container, and is subject to the California laws that regulate beer packaging and labeling. By California law, “growlers” are not required to be sealed after filling and prior to the customer leaving the brewery. However if a customer opens that container before leaving your brewery, and walks outside of your licensed premises with an open container, then your brewery will be in violation of the law for allowing that to occur. As an example of the above points, Jacob offered up the suggestion that if someone presents a brewer with a growler jug from a different brewery, that brewer would be able to cover the pre-existing brewery’s labeling with a sticker, and that sticker could bear the approved labeling of the brewer filling that growler. As long as all pertinent information from the previous brewery is obscured, AND as long as the new sticker is the approved labeling of the filling brewery, no laws are being broken. Sounds pretty simple, right? Well, that’s also what somebody thought who was in attendance at that workshop and posted some of those basic points. The problem – and where things get tricky – is that they didn’t convey ALL of the information that was presented at the workshop, and didn’t seem to pay attention to the remainder of the points presented in that workshop. Suddenly there were bits of growler-filling information flying around the inter-webs, that weren’t entirely accurate, and seemed to promise growler-filling freedom to everyone! The problem is that nothing actually changed. The beer-loving public was lead to believe that a switch had been flipped and suddenly they could bring any container into any brewery and have it filled. Not so. First, Jacob’s suggestion about the sticker solution to the growler-labeling problem was just a suggestion, and not something that every California brewery is able to execute or afford, nor that every California brewery agrees with. Second, there are other legal issues that effect California brewers that were not mentioned in the data-storm of growler-fill misinformation swirling around the blog-o-shpere. The ABC does not make laws. The California State Legislature makes laws. The ABC enforces those laws that relate to the control of alcoholic beverages. If you want an alcohol-related law (i.e. growler filling) to be changed, you need to talk to your state legislators and work through the normal legislative process. Owning an ABC license to manufacture, distribute, or sell alcohol in California is a privilege, not a right. The California ABC Act Code is the section of California State laws that relate to the control of alcoholic beverages, and it is the responsibility of someone owning an ABC license to understand and abide by that code in its entirety. The ABC Act is a set of permissive laws. This means that the ABC Act grants permission to act in a manner that is otherwise prohibited. In other words, if you hold an ABC license you can only act in a manner permitted by the law. If the law doesn’t specify that you can do something, then you can not do it! This last point is perhaps the most important and probably the most misunderstood among the beer-loving public. And I suspect that this is the biggest point of contention as California beer drinkers becoming increasingly frustrated with their local brewers’ recent growler-filling policies. This is completely understandable since, as members of a free, democratic society we’re used to dealing with laws that only prohibit us from doing things. If a law doesn’t specifically prohibit us from doing something, we assume we are free to do it. However, when you own an ABC license (remember it’s a privilege, not a right), you are suddenly held to a different standard. First, all of us California brewers are scrambling right now, trying to figure out how to proceed. Every growler-filling beer lover out there is coming into our breweries with only a partial knowledge of the ABC laws that govern us, but a whole lot of entitlement and attitude that we have to fill their growlers from other breweries. Although the ABC Act does allow for the filling of “growler” containers, no brewery is required to fill any container it doesn’t want to fill. Second, no California brewers that I’m aware of have adjusted their approved growler labels based on Jacob Appelsmith’s recent statement. In other words, no one has acted on Jacob’s suggestion about “growler-stickers” for obscuring old brewery information, and displaying new (and approved) brewery information. And therefore, no brewer that I’m aware of is able to fill any container other than what they are already approved for. Third, consider the different sizes and shapes of growlers out there. As a brewer, am I expected to have different sized or shaped stickers for each growler size/shape? Should I be expected to carry all manner of growler-lids or closures for those different sized/shaped growlers? Legal matters aside, the most important consideration in this current growler-filling issue is your relationship to your local brewer. 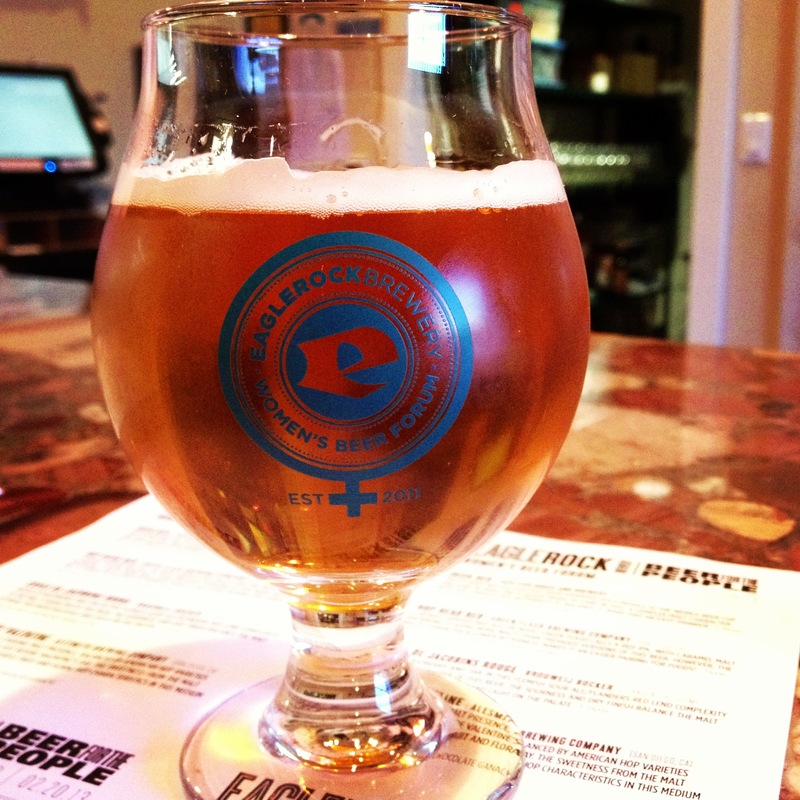 You really enjoy their beer, and you enjoy supporting their business. You’re happy with the fact that they work extremely hard to bring you the freshest, most high-quality beer they possibly can. They’re happy that you enjoy their beer and support all their efforts. Everyone enjoys being part of a friendly and flourishing industry. Every brewery is different and will have different policies. Aside from their legal obligations, these are the policies that make sense to keep them in business and to keep the quality of the beers at the absolute optimum. If your local brewer declines to fill your growler (bearing their approved label) because it is dirty – respect that decision. Respect the beer. Don’t leave your growler dirty, because it can lead to the beer quality in that growler to diminish very quickly. (And when you review that beer on RateBeer or BeerAdvocate or another site, that will result in lower marks than that beer probably deserves…which would be your fault!). Don’t expect your local brewer to fill your Nalgene container, or Camelbak. These are not containers intended for packaging beer and (legal issues aside) will not preserve the quality of that beer in the way the brewer intended. Again, respect the beer and respect the brewer. Ultimately (and probably soon), I’m sure the brewers of California will come to a suitable solution to this growler-filling confusion. For the time being, most brewers I know are staying with the status-quo in order to stay on the right side of the law. Perhaps some California brewer will have an approved label configuration for other brewers’ growlers. Perhaps the State Legislature will pass a law further clarifying the growler-fill situation. 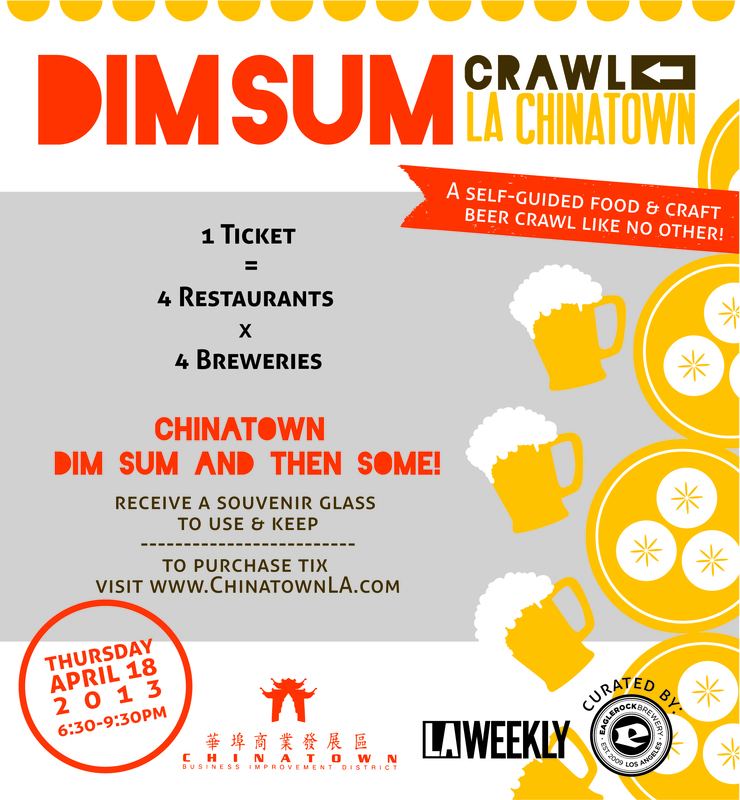 Until that time though – be patient, dear craft beer lovers – the brewers of California are just as confounded as you, but also have a lot more at risk. We admire and support our fans just as much as they admire and support us. At the end of the day, at least we can still share a pint together – whether or not that pint was poured from a growler, a bottle, or a keg! Good Grief! What’s Going on With Growlers in California? 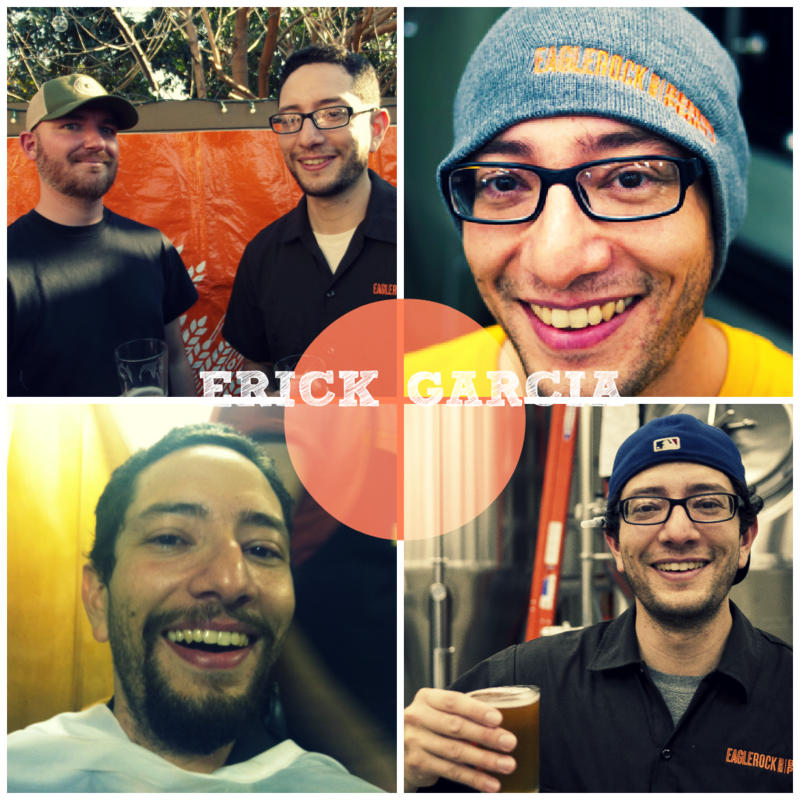 So to continue the series we are going to introduce you to our head brewer, Erick Garcia. When asked the following questions, here were Erick’s well-thought out replies. Director of Microbiological Research… or Head Brewer. Exploring Los Angeles with my fiance. She’s always scouting out fun spots. 3] What your best memory from your time here at the brewery? Annnnnd Go! Our last anniversary party (3rd) was awesome! It is humbling to see so many people come out and celebrate with us! If it’s a desert island… it’s gotta be hot so I’ll say german pilsner and mussels. The ability to fly so I can get off that desert island! I’d have someone build a time machine so I could travel back in time to brew some porter with George Washington. Florence and the Machine… enough said. Well, Brussels is near the top and it’s kind of odd that the Manneken Pis is such a huge tourist attraction. Sierra Nevada, Anchor, Firestone Walker… they all make fantastic beer and rarely have I had one of their products that I didn’t like. probably hiding out in a cabin… trying not to be found.